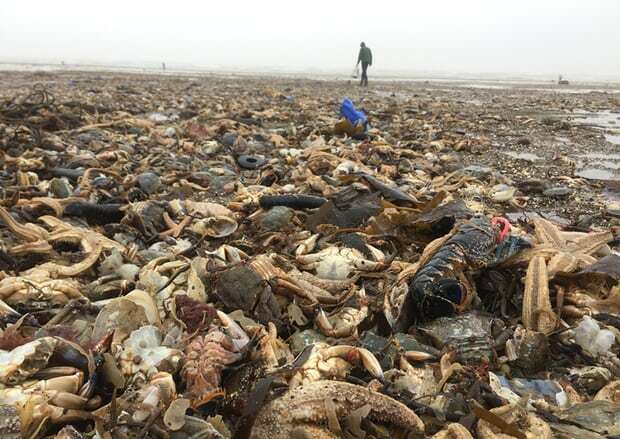 Massive numbers of starfish, crab, mussels and lobsters have been washed up on the North Sea coast of the UK, following the recent freezing weather and storms. Tens of thousands of creatures are piled up ankle-deep in places along the Holderness coast in Yorkshire and similar mass mortality has been reported in Kent and Norfolk. The casualties are mostly invertebrates though some fish were also found. “Larger animals such as dolphins are more mobile and can save themselves by swimming away when this sort of thing happens,” said Lynam. All the organisms piled up on the shores were dead, except some of the lobsters. Yorkshire Wildlife Trust’s team worked alongside local fishermen to rescue the surviving lobsters, collecting them in buckets and taking them to tanks in Bridlington. The aim is to put them back in the sea when the weather improves. Large numbers of dead animals were also found at the Norfolk Wildlife Trust’s Holme Dunes reserve near Hunstanton. Local warden Gary Hibberd said he had seen crabs, squat lobsters, starfish, sea anemones, sea cucumbers, sun stars and whelks. Dr Lissa Batey, senior living seas officer at the Wildlife Trusts, said: “We can’t prevent natural disasters like this”. Holderness inshore waters are already designated as a Marine Conservation Zone (MCZ) and the government is due to announce a consultation into more MCZs this year.